I love Charlie Chaplin. I was first exposed to Chaplin while in high school. In fact, I think my interest in film coincided with my first exposure to the genius of Chaplin. I remember the first film of his I ever saw: Payday. The film was made in 1922 and featured the familiar "tramp" character. There was something about that character: the waddle, the twitch of the mustache, the endless striving to do what is right but always, somehow, falling just short. In essence, Chaplin represented us. All of us. My fondness for Charlie Chaplin was channeled into the character of Robert Bishop. A loner, living in the metropolis that was Chicago in the 1910s, Robert took refuge in the many Chicago theaters, escaping into the relatively new world of cinema. And, in particular, the world of Charlie Chaplin. On June 24, 1917, Robert attended the Gem Theater, located at 450 South State Street, to catch a recent Chaplin film entitled The Cure. Although the Gem screened movies, it was also known for its vaudeville and burlesque shows. This was true for all of the theaters located in that area of town. The more respectable theaters were in the north Loop. 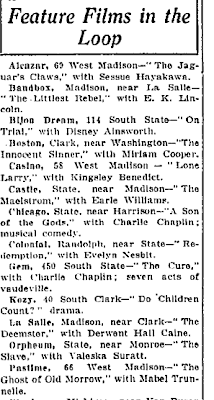 Unlike today, most theaters changed their films on a daily basis and papers like the Chicago Tribune featured extensive lists of the daily films. The Gem was a rather small theater, with seating for just over 400 people. It was warm and smelled of booze, urine and sweat. The dancers had been through for an afternoon show and a man was rumpled in a corner seat of the theater, passed out---probably the source of the piss odor, Robert reckoned. Other patrons sat here and there, talking loudly. Others were walking through the isles, looking for seats. The crowd was mostly men, as women were more likely to patronize the respectable theaters to the north. The women who were in the audience were working, so to speak, and sometimes conducted their business right there in the darkness of the theater. Although movies were not the main attraction at most of the houses on lower State, Robert, in fact, was there not for the dancers, but for The Cure, a Charlie Chaplin comedy that was set to kick off seven acts of vaudeville and burlesque. He didn’t know if he was going to stay for the entire evening of entertainment as he had tickets on the Illinois Central for the following morning and needed to be at Central Station by 7:30. But he had specifically come to this theater to see Charlie Chaplin. Although the film had played last week at another theater, he was unable to make that screening and he wanted to catch the show before boarding the train to Iowa. Robert had become a fan of Chaplin from the moment he saw His New Job back in 1915. That film was Chaplin’s first for Essanay Studios and was his only film to be made completely in Chicago. Located in the uptown neighborhood on Argyle Street, Essanay Studios had been one of the leading movie studios in the country, making films in Chicago for the last eight years or so. In fact, Essanay was the training ground for many of the nation’s top performers: Chaplin, Francis Bushman, Broncho Billy Anderson and Gloria Swanson, to name a few. Unfortunately for Essanay, those stars quickly left for more lucrative contracts in California. Although they had built another studio there in the more conducive weather of the west coast, Essanay was quickly getting crowded out by larger, more heavily financed ventures. Consequently, the Chicago branch of the studio was losing influence. When the lights dimmed at the Gem, Robert pulled out the growler of Edelweiss and downed a mouthful. Unlike the larger theaters in the Loop that sometimes had full orchestra accompaniment to the features, the Gem only had a lone piano player for the movies; the band that played during the vaudeville portions of the show took their breaks during the pictures. Unfortunately, the piano was sometimes not enough to drown out the moans and groans from the darkest corners of the auditorium. That didn’t matter to Robert, though. He wasn’t there for the music or anything else. When that small screen flickered and the title card appeared, he became lost in the images. Over the last couple of years, Robert had grown accustomed to Chaplin in his familiar costume: bowler, dark coat, oversized shoes, flexible cane and that small, twitchy mustache. That persona was well established in such films as The Tramp and Police. In fact, that persona made Chaplin famous and “Chaplinitis” had overtaken the city, according to the papers. Chaplin impersonators could often be found in the parks and along the shopping district of North State. Movie houses often hired them to stand outside under the marquees whenever Chaplin films were playing. However, this film was slightly different from the onset. Charlie was not in his familiar frayed jacket, but in a respectable white coat. He was now wealthy. And drunk. Not the true tramp of past films. Being led here and there by an attendant at a sanitarium, familiar antics follow. Charlie is drunk and caught in the endless turning of a revolving door. While he pretends to bathe at the pool and avoid the overzealous masseuse, the alcohol in his suitcase is discovered in his room and thrown out the window. It lands in the mineral spring and all who drank from it find themselves drunk as well. But, in the end of this film, Charlie actually gets the girl, which usually didn’t happen. That was what Robert liked: the fact that Charlie, an ordinary man---usually a tired and forlorn tramp---winds up at the end of the film just as he was in the beginning. Sure, he might be alone, walking in solitude as the picture fades, but you know one thing: this is not the end. The tramp is the eternal optimist; brushing off the dust, he simply walks to the next adventure, whatever that may be. The Gem Theater opened in 1905 as The London Dime Museum. Three years later it became The Gem and by the 1950s the theater was only staging burlesque and was known as The Follies Theater. It burned in 1978. Today, the main branch of the Chicago Public Library sits on the site. The Gem and countless other small theaters have long gone dark, but the genius of Charlie Chaplin lives on. I am amazed at his comic timing, his tenderness----the warmth that comes forth from that little man in the ragged suit. The Cure may not be his best film. Far from it, in fact. But it it does give a hint of what is to come from a man who many have tried to emulate. However, few---if any--have ever come close.